Handmade dinosaur bone ring with white sapphires set in sterling silver by Hileman Silver Jewelry. 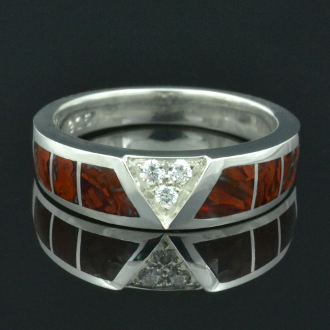 Three pieces of dinosaur bone are inlaid in each side of this ring with 3 pave` set white sapphires in the center. The fossilized dinosaur bone is a reddish orange with an unusual pattern and it highly agatized. The sparkling white sapphires total .09cts. and are in a triangle cluster. The ring is 5.6mm wide at the top and tapers to 3.2mm wide at the bottom (shank). The dinosaur bone ring in the photo is shown in a size 6 1/4 for scale. Your ring will be made to order in your ring size in about 3 to 6 weeks. You may customize this ring by substituting other inlay materials for the dinosaur bone or other gemstones in place of the white sapphires. Additional charges will apply if your choices are upgrades. This ring style (WD186) is a popular choice for a unique engagement or wedding ring. The second photo shows the same ring inlaid with green chrysoprase. Most of our rings can be made in stainless steel as well as 14k white or yellow gold for an additional charge. Contact us with your ring size for a price quote.